Description: Who’s the client? Well, now, therein lies the first puzzle. When the police arrive at the scene of the accident, Poppy Oliver claims she’s only trying to help. Description: South Cove’s local businesses are up in arms after volunteer fire chief Barry Gleason threatens to shut down anyone who doesn’t comply with the fire code. But when Barry schedules a training burn in an old abandoned barn, he is the only one who doesn't come out alive. Jill Gardner—owner of Coffee, Books, and More—smells murder in the ashes. She’ll have to work quickly to nab a killer with a short fuse—or else everyone’s holiday will end with a fizzle . . .
After seeing Susan Boyer at Malice, I want to try her series. I told about those fans she gave out. Sadly, mine wouldn't fit in the boxes I sent home and I had to leave it behind. Sigh. The Susan Boyer series is on my list of books I want to read. 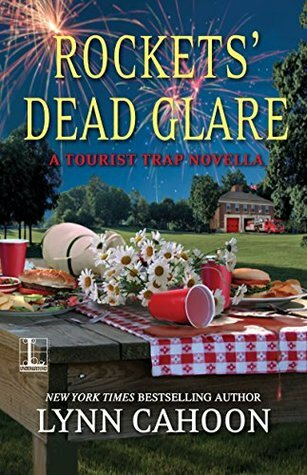 I do love the Tourist Trap Mysteries by Lynn Cahoon. I just finished Rockets Dead Glare but haven't wrote my review yet. I loved it. These both sound good and I like the settings of each. Thanks for sharing, I am glad you enjoyed them. I really like the sound of both of these. I really want to read Lynn Cahoon so this might be a good way to try her work. 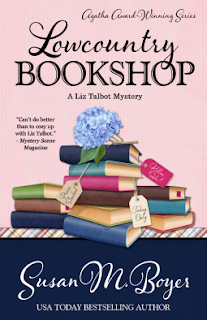 It's great to get two that you really enjoyed, if I had to pick it would be Lowcountry Bookshop, not just because it has bookshop in the title!! Two cozies I need to add to my to read list! These both sound fun, Katherine.